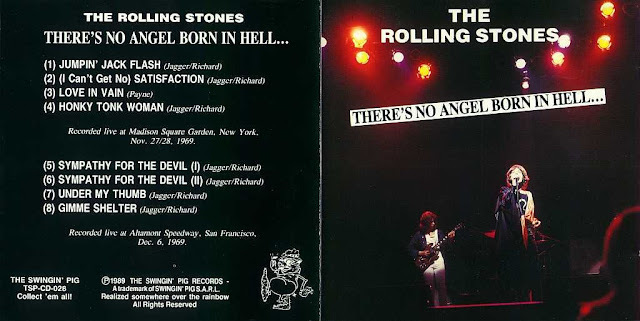 Bootleg Rambler: The Rolling Stones - 1969 Soundboard Compilation "There's No Angel Born In Hell"
The Rolling Stones - 1969 Soundboard Compilation "There's No Angel Born In Hell"
*Track3 is Civic Center, Baltimore, MA (Nov.26,1969) ? Thank you so very much for hearing my desperate plea! I recently had a backup drive go down. And while I was waiting for a replacement to arrive, another one with most of the masters was inadvertently reformatted! A WD flaw, to be sure. So I lost this file along with many many others. This was a special one with me, and I just could not recover it anywhere. Here is the first place I checked, of course. : ) Thanks again..... Really. Thank you.